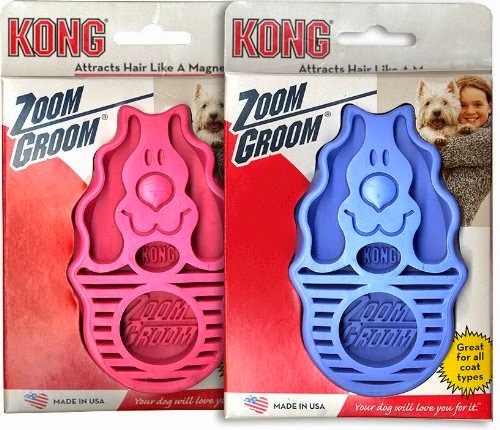 I was whining about the challenges of washing a double coated dog when a friend suggested the Zoom Groom from Kong. I had never heard of this. Have you? It's a weird looking rubber brush that you can use on either wet or dry fur. My friend said to use it when shampooing. Zoom Groom is only about $10 at Petsmart so I thought I'd give it a try the next time I bathed the dogs. It's easy to hold on to, even with wet hands. The firm, rubber nubbies do an excellent job of getting the shampoo through the undercoat all the way to the skin. They remove any loose hairs in the process. (I had to clean it out four times on one dog -- and that was after his pre-bath brushing.) And by the look on Jedi's face, it feels pretty good massaging the skin too.